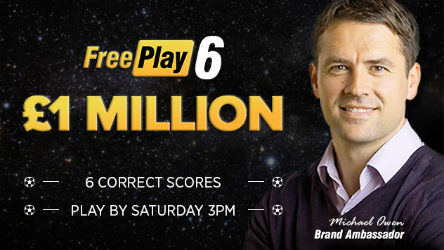 A £1M FreePlay 6 Jackpot! ColossusBets FREEPLAY run every week. Players can shoot for a £1,000,000 Jackpot for absolutely FREE, by picking 6 correct scores in the weekend’s headline football fixtures. During Half-Time and after Full-Time of each match, if your ticket is still eligible for the win prize fund, you will receive Cash Out offers. And there will be consolation prizes for players with 4 correct scores and 5 correct scores out of 6. Don’t forget too, that if you want to give yourself more chances of scooping a life-changing jackpot, you can always play multiple lines on the ‘real money’ tickets. Possible winnings from the FreePlay 6 game? £1,000,000 for 6 correct scores! £1,000 for 5 correct scores! £500 for 4 correct scores! And you can also BANK PROFITS on your ticket as matches progress with the Cash Out offers! How to play free for the £1,000,000 Jackpot? Sign up here now (it’s free). Click on the ‘FREEPLAY’ tab. Pick a score for each game in the coupon. Click ‘Play’ to place your FREE bet. Now you can win the £1,000,000 Jackpot!